*Ala-Am DYP: $3 entry > trophies .../... Open BYP: $10 entry > 100% payback w/$50 added! Events include: Ala-Amateur singles, doubles, Trooper doubles, handicap singles & DYP. * Trophies and $$700 cash$$ added! ...[RESULTS], [NEWS]. 12-31-05 New Years Eve Mini-Bash! Ala-Am singles & DYP @6pm. 8pm-Open BYP w/$50 added! During the special Invitational State tournament this past weekend players competed once again for bragging rights, trophies, and/or a portion of $700 added cash where several local players revealed there true foos-skill. Most notibly was Susan Chapman, who WOWED everyone with her outstanding performances during the Ala-Amateur events. Susan won the Am'doubles event teamed with Nick Peterson, while also finishing 2nd in the Am'singles event where she forced a tough second-set final with Josh Parker, who put together outstanding performances during the Saturday of competition as well. Josh Parker, as said, won Am'singles, then placed 2nd in Am'doubles teamed with Al Widok, and then won the winners bracket of the Handicap Doubles event, but was eventually abused by none other than his father to finish the event 2nd place. Several amateurs are graduating from the Ala'Am rank for yr-2006, you probably know who. James Porter had a couple outstanding performances for the tournament, he and Ken Williams captured the "Trooper Doubles" win, double-defeating Randy Parker and Tony Gamso in the final. James also won the Handicap Doubles and placed 4th in Handicap Singles. Randy Parker got hot in the later part of the tournament and won both the Handicap events coming back to the final from the losers side of the chart. For 2006 also, several players are graduating from the Trooper ranks, you probably know who also. Congrats to all who've captured titles during this event and especially to all who've improved their foos-skills during 2005. As a result of competing in this tournament and the "every week" tournaments presented during the year, several have improved their level of play by leaps. Hope to see you all continue this trend! If I can help, don't hesitate to ask. A special Alabama Invitational State Championship tournament is planned for Saturday December 3rd. Now that the "annual open state tournament" is behind us, I wanted to cap it off with a few events similar to what we've had going on locally here in Alabama throughout the year and for those who've been a part of it. This tournament will feature Ala-Amateur Events (singles, doubles, & womens doubles), Trooper Doubles, and finally Handicap Events (doubles & singles). Those folks listed in the Program's most current player ratings who've participated in any of these events sometime during this year(2005) are invited to participate in this special championship tournament finale. As usual those interested will be eligible as dictated according to their class point rating within this Program. Players rated BEGinnger, D class, C class, & B class will be eligible to compete as "Ala-Amateur", while those rated AA/5 and below will be eligible to compete in the "Trooper Doubles" playoff. Of course, everyone's familiar with how the handicap events play out. 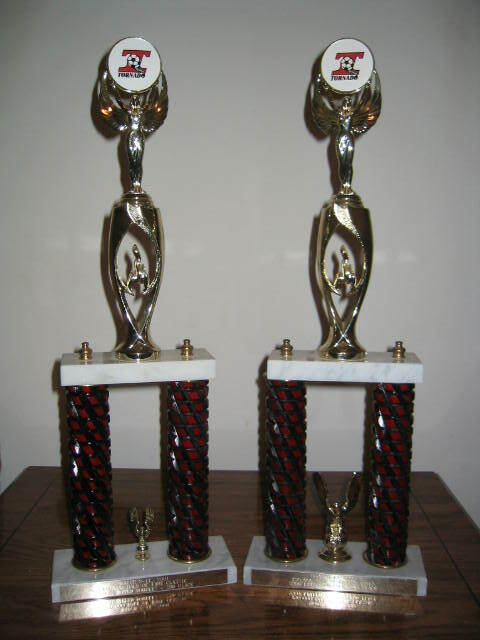 First place trophies will be distributed for the Ala-Amateur events while the entry fee is $5 per player. All others events will require a $10 entry per player and will feature the 100% payback procedures with possibly considerable cash added. ...5pm = Handicap Singles, ...8pm = Handicap Doubles. Efforts will strive to near complete each event prior to the next starting. If needed, the tournament will continue at noon on Sunday. Flyers will be eventually be posted at the Program's local tournament sites. During the State tournament this past weekend, Lenette Wisener announced that she would be stepping down as the tournament director for the weekly events at the bowling center in Cullman. 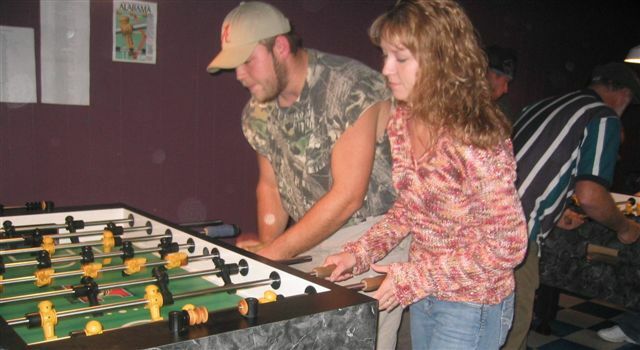 I'd like to thank Lenette & Dustin for all their efforts during this past year which has been instrumental in the, long overdue, re-ignitment of the local foosball scene here in Cullman. For all those who've come to enjoy this every-week foos-gathering, I'll do my best to keep it going for you, until a new coordinator is named we'll have to get by with the "floating tournament director" procedures as described on the "Standard Procedures" page of this site and Program---at least when I cannot be present myself which I plan on being there to handle the duties as much as possible. Thank you for your help and continued support, the bowling center has rearranged the gameroom somewhat to allow the foosball tables to be setup in a more user-friendly arrangement. See information about the floating tournament director procedure. Personalities exploded in Huntsville, Alabama during the Southern Foosball Program�s Eighteenth Annual Alabama State Championships of foosball. Steve, Steve, Steve comes to the top of this report, as Alabama�s own, ~MR. DODGEN~ to us, captured his very first-ever triple win. The event was held during the weekend of November 4th through 6th with a total of sixty-six players participating and more than $4,000 worth of cash and prizes distributed, of which, Steve Dodgen earned the largest portion by winning three open event titles�open doubles with Mickey Munger, open mixed with Kim Parker, and open singles all by his lonesome. Congratulations to Steve along with others who were able to play their way into Alabama foos-history for this year 2005. Others winners including Jim Wiggs, of Springville, and James Porter, of Huntsville, who teamed together to claim a large portion of the prize package with a win of the no-pro doubles event. Players traveling from the Memphis area captured both remaining singles titles, Chris Whittaker won a very tight contest during the finals of the no-pro singles over Florida�s Dan Williams and Chris Odle came from the losers side of the rookie singles chart to defeat Alabamian Jamie Milam. Jackson, Mississippi�s Shannon Coley & Dewey Culpepper claimed victory of rookie doubles. The host facility, �Billiard Street Caf�, helped us greatly providing an outstanding background for the championship tournament where most seemed to have an outstanding time during the weekend of events. I�d like to thank all that participated and helped create another great weekend of foosball competition here in Southern USA. Additional results are posted at [RESULTS] and pictures at [PICTURES]. 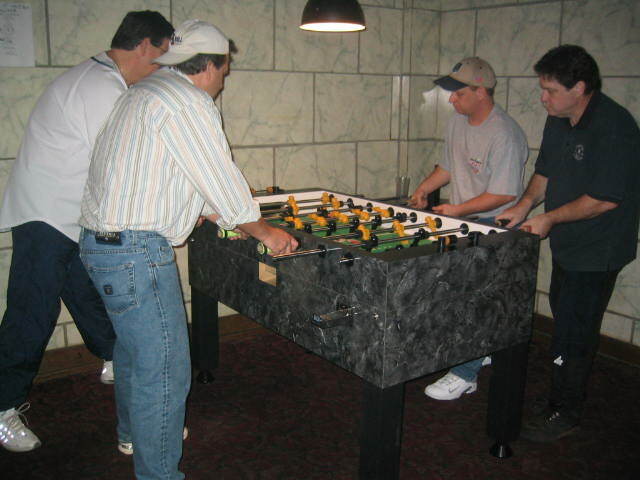 Local foosball player James Porter has several foos-friends traveling to visit him in Huntsville during the weekend of May 21st; he plans to coordinate a DYP & BYP foosball tournament at "Billiard Street Cafe" on that Saturday beginning at 6pm. James and his friends have extended an invitation to anyone else interested in participating in the Porter's Friends Foosin' get-together. The entry for each event is $10 w/100% payback intended to the top finishers. The weekly tournament in Cullman has been changed to Saturday evenings for convenience of those participating during the summer months. Great turn-outs for these tournaments and lots of fun! I will be adding a 3rd foosball table in the next week or so. AlaFooPro presents the cash-added Super "Trooper" Invite which is a special tournament for players who have participated in at least one of the Southern Foosball Program's open doubles events during 2005. The Sunday evening event will include singles @3pm & doubles @5pm with $10 entry fee required and cash added to the entry-fee-payback procedure for both tournaments. Players rated AA/5 and under are eligible and those who fit the described qualifications are invited to bring a partner and participate at the Cullman Bowling Center on Sunday February 27th 2005. Most of the tournaments feature the handicap format, which sometimes dictates additional requirements for the more experienced players in order to win games/matches when involving less experienced players. Also, there are quite a few entry-level players participating in these events, we want to maintain an encouraging atmosphere and attitude for these participants. Cullman is a dry county, no alcoholic beverages are sold anywhere near--you will not be allowed to bring outside drinks or food into the building. The business is family oriented and it wants to maintain a respectable image, participants of the foosball action are asked to please dress appropriately and please do not use foul language and/or behavior unsuitable for children. At some times you'll need to watch out for small children wondering about and sometimes they are curious to watch, please do not be rude to them. Please consider these conditions thourougly prior to coming to tournaments presented at the Cullman Bowling Center in Cullman, Alabama.